An example of a baseball team's uniforms in the 19th century. These are the Baltimore Orioles in 1896. A baseball uniform is clothing that baseball players wear during games. They do this to indicate which of the two baseball teams they play for. Most baseball uniforms have the names and uniform numbers of players who wear them somewhere on the uniform. The names and uniform numbers are usually on the backs to tell different players from each other. Baseball shirts, pants, shoes, socks, caps, and helmets are parts of the uniforms. Players also wear gloves, but they are not considered part of the uniform, since the players can choose their own glove. Most uniforms have different logos and colours to tell which team is which. Baseball uniforms were first worn by the New York Knickerbockers Baseball Club in the 1800s. Their uniforms were pants made of blue wool, white flannel shirts and straw hats. Since then, the uniforms have gone through many changes. More items, ideas, and many other improvements were done and added to these uniforms over the years. Their style also changed, little by little over time. On April 4, 1849, the New York Knickerbockers became the first team to use uniforms. In 1882, different colors that showed the different fielding positions each player had were added on uniforms and stockings (garment covering the foot and lower part of the leg). 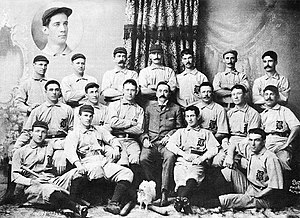 In 1888 and 1889, the Detroit Wolverines and Washington Nationals of the National League and the Brooklyn Bridegrooms of the American Association added stripes to their uniforms. By 1900, all players in Major League Baseball teams were using uniforms. By the end of the 19th century, baseball teams started wearing two different uniforms. They wore one uniform when they played in their own baseball stadium (called "home games", "playing at home") and another when they played at another team's baseball stadium ("away or road games", "playing on the road"). It became normal to wear white at home and either gray, solid dark blue, or black colors on the road. In 1907, the Brooklyn Superbas used a blue pattern for their road uniforms. The New York Giants later used a pattern almost the same as to what the Brooklyn Superbas used on their road uniforms. In 1916, on the Giants' uniforms, many purple lines gave them a tartan-like color. At this time, another kind of road uniform was a solid dark blue or black material with white. In 1963, Charles O. Finley changed his Kansas City Athletics home and road uniforms. They were changed to the colors of gold and green. In the 1970s, some teams used light blue for their road uniforms. Pinstriping (long vertical stripes along uniforms) were created in the 19th century. They were first worn on some major league baseball team's uniforms in 1907. The pinstripes were soon widened in 1912, so that people could see them more easily. Pinstriping was used again when the Brooklyn Bridegrooms started to wear them in 1907, 1916 and 1917. During that time when the striped uniforms were made again, other things for the baseball uniform were added, such as satin. The team that often wore pinstripes was the New York Yankees. They were first used in 1912. But the Yankees' pinstripes (on their home uniforms) have become a symbol of the Yankees. Because of that, books about the Yankees started to be made with pinstriped covers. Numbers were first added to uniforms by the Cleveland Indians in 1916. In 1929, numbers were first added on the backs of baseball uniforms by the New York Yankees and the Cleveland Indians baseball teams. By the 1930s, it was normal for baseball uniforms to have numbers on them. The Yankees were one of the first baseball teams to wear uniform numbers. This was because of their normal position in the New York Yankee's batting order (Babe Ruth 3, Lou Gehrig 4, etc.). By 1932, all major league baseball teams had numbers on their player's baseball uniforms. The numbers were on the backs of the shirts, with the team name or logo on the front. But in 1952, the Brooklyn Dodgers were the first team to put numbers on the fronts of baseball uniforms. As players began to have their own numbers on their uniforms, "retiring" a number of special baseball players started to happen. While testing new ideas to add to baseball uniforms, new designs and ideas were created. For example, the Houston Astros of the 1970s and 1980s, added numbers on the fronts of pockets on pants as well as on the back of their shirts. Shoulder patches on baseball uniforms were worn usually in honor of something. The first patches to be used on major league uniforms were worn by the Chicago White Sox in 1907. The first patch to be worn on all 16 major league uniform sleeves in one year was in 1939. The second time patches were used in all the professional baseball teams, also with the minor leagues, was done in honor of the grand opening of baseball’s Hall of Fame in Cooperstown, New York. The third patch to be worn by all teams, was the rectangular Major League Baseball centennial patch in 1969 in honor of 100 years of professional baseball. Many of the ballpark anniversaries have also inspired special patches to those who have recently died have been using patches rather than the traditional black arm bands (an item a person wears) of earlier decades. From the 1840s to the 1870s, baseball players wore many kinds of hats, such as straw hats. Caps, or other kinds of headgear with eye shades (something that shades a person's eyes), have been a part of baseball uniforms since they were first created. In 1860, the Brooklyn Excelsiors were the first team to wear what would later become the baseball cap. Before that, teams often wore full-brimmed straw hats or no cap at all since there was no official rule in baseball about whether players had to wear caps or not. By the early 1900s, rounded top parts of a hat became the normal fashion. Other teams would sometimes use the flat-topped cap, such as the Giants in 1916, and the Pittsburgh Pirates in their 1979 World Series championship. Baseball caps have changed very little in recent decades. Over time, a bigger sun visor (the front of caps) has been made. The reason of the cap stays the same: to protect the player's eyes from the sun. In the late 19th century, baseball players started to wear the soft but long-lasting leather shoes. Soon, removable spikes were designed and were used many times until 1976, when they were banned from baseball games. Soon after, white shoes, as well as solid reds and blues, became popular. As artificial turf was used more in baseball fields, changes to shoes were needed. In the 19th and 20th centuries, baseball shoes were mostly colored black. The Kansas City Athletics designed new white shoes in the 1960s. The stocking colors of teams were a way of telling one team from another. Stockings in 1900 were made of wool that were high in weight and were made of one-piece at full-length (above the knee). The foot covering part below the ankle bone was colored white or natural wool. It often created the illusion of stirrups. In 1868, the Cincinnati Red Stockings started to play in short trousers so their stockings could be seen. This led to the team's nickname. Teams started to be called the Chicago White Stockings or the St. Louis Brown Stockings because of what colored stockings they wore at the time. Some teams wore "candy cane" stockings instead of stripes during the 1920s; these included the Giants, St. Louis Cardinals and Washington Senators. From the beginning, graphic designs were used to tell different teams apart. An Old English letter was worn on the fronts of baseball uniforms on the chest. This style is still being used today by the Detroit Tigers and their Gothic style "D" on their home uniforms. Road jerseys were able to tell the city the team it is from, as with the Tigers wearing the word "Detroit" on their road uniform shirts meaning the team's home city is Detroit, Michigan. Some early examples are a small red tiger on the black cap of the uniforms of the Detroit Tigers in 1901, as they were officially the Tigers from the beginning; and a bear cub logo on the Chicago Cubs' uniforms by 1907, as that unofficial nickname later become the official name of the baseball club. In another famous example, the Boston Americans (an unofficial name that made it easier to tell different teams apart) used the Nationals' red stockings in 1908 since the Nationals did not use them anymore. They have been called the Boston Red Sox ever since. A baseball glove is a leather glove that baseball players wear. They are used to catch a baseball that are hit by a batter or thrown by an outfielder. When baseball gloves were first made, they were not used very much. Many baseball players who first wore baseball gloves or a type of them were often teased and taunted when they were used. The first baseball glove to be worn was by catcher Doug Allison in 1870. Allison's hands were split and cracked open from catching in other games earlier in the week. He decided to wear something that would protect his hands so that they would not be damaged more. He got laughed and mocked at by his teammates because of his glove. In 1875, five years later, first baseman Charlie Waitt wore a glove for protection. His teammates also laughed at him. When baseball star Albert Spalding started to use baseball gloves for protection, more baseball players started to do what he did also because of his fame. Soon, all baseball players started to wear baseball gloves. In 1920, Bill Doak, a pitcher for the St. Louis Cardinals, asked that a web be placed between the first finger and the thumb of the glove for more protection. This was because more baseball players started to have more cuts and bruises because baseballs were thrown harder. This design was soon added to baseball gloves, and webbed gloves were starting to be used by all baseball players. In the 1940s, gloves would lace the fingers together for more control using the glove. The most recent idea added to baseball gloves was making the pocket of the glove deeper and finally making small baskets in the glove so that pitchers can hide their pitching grip. Baseball helmets are hard hats that baseball batters wear to protect their head from a baseball being hit or thrown at them. Roger Bresnahan created the first batting helmet after getting hit in the head one game. From here, helmets started to be worn by more players, and then players had to wear them in the seventies. Usually they try to make a design the same look as the regular home cap, and the same helmets are used on the road even if the soft road cap is different when looking at it. Sometimes, for practical reasons, the batting helmets that were used around the 20th century are still being used even after it was redesigned in recent years. Baseball uniforms have changed very much for many years when each part of the baseball uniform was created. However, many parts of baseball uniforms made many years ago are still being used today. For example, since each part of baseball uniforms were created, they improved until today, such as baseball gloves that now have small pockets, laced fingers, and many other technologies. Another example would be that very few major league baseball players wear matching colored shoes and shoes that are completely black, although they did in the 19th and 20th centuries. Baseball numbers on backs and fronts of uniforms are still on backs and fronts of baseball uniforms today, and have been since 1932. The cloth used on baseball uniforms are also still being used today with some improvements. Often, a team will have a home uniform, an away uniform, a "Sunday game" uniform, uniforms that are worn only during batting practice, and uniforms worn only on special events. Also in recent years, there has been an increase in the popularity of the throwback uniform. Current Major League Baseball uniforms have to follow rules, such as no advertisements on uniforms and that all players must wear their number on the back of the uniform. ↑ Robert Riles (8 April 2008). "History of Baseball Uniforms". www.americanchronicle.com. Retrieved 2008-06-25. ↑ 2.0 2.1 2.2 2.3 2.4 2.5 "Baseball Uniforms in the Major Leagues: The Evolution of the Battle Suit". www.fireflyarticles.com. Retrieved 2008-07-15. ↑ "The history of the baseball uniform at the National Baseball Hall of Fame". exhibits.baseballhalloffame.org. Retrieved 2008-06-14. ↑ 4.0 4.1 4.2 4.3 4.4 "American Chronicle: History of Baseball Uniforms". www.americanchronicle.com. Retrieved 2008-07-10. ↑ "Uniforms of the 19th century are different from toda's". www.prlog.org. Retrieved 2008-07-10. ↑ "Date when the New York Knickerbockers wore the first baseball uniforms and what they were made of". iterpret.co.za. Retrieved 2008-06-30. ↑ "History Of Baseball Uniforms In The Major Leagues". interpret.co.za. Retrieved 2008-05-02. ↑ "The history of the baseball uniform at the National Baseball Hall of Fame". exhibits.baseballhalloffame.org. Retrieved 2008-05-11. ↑ "National Baseball Hall of Fame - Dressed to the Nines - Uniform Database". exhibits.baseballhalloffame.org. Retrieved 2008-05-02. ↑ 10.0 10.1 10.2 "History Of Baseball Uniforms In The Major Leagues". www.isnare.com. Retrieved 2008-07-15. ↑ 11.00 11.01 11.02 11.03 11.04 11.05 11.06 11.07 11.08 11.09 11.10 11.11 11.12 11.13 11.14 11.15 11.16 11.17 "Baseball Uniforms of the 20th Century by Baseball Almanac". www.baseball-almanac.com. Retrieved 2008-05-02. ↑ 12.0 12.1 12.2 12.3 12.4 12.5 12.6 "Baseball uniforms at Baseball Almanac.com". baseball-almanac.com. Retrieved 2008-05-28. ↑ "The Official Site of The San Francisco Giants:History: Giants Uniforms and Logos". sanfrancisco.giants.mlb.com. Retrieved 2008-05-02. ↑ 15.0 15.1 15.2 "Major League Baseball history of pinstripes". www.customauthenticjerseys.com. Retrieved 2008-08-13. ↑ "History of Pinstriping". www.customauthenticjerseys.com. Retrieved 2008-06-29. ↑ 18.0 18.1 18.2 18.3 18.4 "MLB Uniform History - Jersey Numbers". www.customauthenticjerseys.com. Retrieved 2008-07-15. ↑ "Baseball Uniforms - History of Baseball Uniforms". www.pr-inside.com. Retrieved 2008-05-02. ↑ "National Baseball Hall of Fame - Dressed to the Nines - Parts of the Uniform". Baseball Hall of Fame. Retrieved 2008-05-02. ↑ "A short history of the baseball cap. (The Home Forum) - The Christian Science Monitor". www.highbeam.com. Retrieved 2008-05-02. ↑ "Happy 50th, Baseball caps". BBC news. Retrieved 2004-04-27. ↑ "History of baseball caps". www.srfboy.com. Retrieved 2008-06-29. ↑ "Celebrating the rich history of baseball caps". mlb.mlb.com. Retrieved 2008-06-29. ↑ "History of baseball caps and how it is made". www.madehow.com. Retrieved 2008-06-29. ↑ "Baseball Shoes". Baseball information. Baseball.mu. Retrieved 2008-05-03. ↑ "Victory Custom Athletic - Baseball Uniforms - Baseball Team Uniforms". www.victory-la.com. Retrieved 2008-05-02. ↑ "Parts of the uniform - stockings". Baseball Hall of Fame. Retrieved 2008-06-25. ↑ "History of baseball stockings". www.villagevoice.com. Retrieved 2008-05-03. ↑ "History of the Boston Americans and their uniforms". www.redsoxnation.com. Retrieved 2008-05-27. ↑ "A Brief History of the Baseball Glove". www.lasr.net. Retrieved 2008-07-12. ↑ 32.0 32.1 32.2 32.3 32.4 32.5 32.6 "The History of the Baseball Glove". www.sportales.com. Retrieved 2008-07-12. ↑ "Baseball throwback uniforms with pictures of throwback uniforms". ESPN Page 2. Retrieved 2008-07-14. ↑ "Official Rules of Major League Baseball". MLB.com. Retrieved 2008-07-14. Wikimedia Commons has media related to Baseball uniform. This page was last changed on 17 June 2018, at 11:12.